Beautiful Incentives: Felix the Cat purse Review & Giveaway! Felix the Cat purse Review & Giveaway! When I first laid eyes on Bagblaze, those prices were indeed, hot. The name fits the site perfectly. You won't find any bags over $40. Some bags are worth over $100, and more than half the price off. The way this site works is every day at 10am (PST) blazing deals on purses are put up for only 72 hours. During that time, you can purchase one for a low price. The best part about this store is that they offer free shipping, which is always a nice incentive to shopping at any store. When I approached Bag blaze for a review, the generous owner offered me a bag of my choice. There was so much variety and unique choices. The color choices were plentiful, and the dimensions were laid out perfectly, so I knew exactly what I was getting. The pictures were bright and clear and you are able to zoom in close up. I had fun looking around. The color scheme I chose was red & black. I thought the colors really complemented the design well. When the bag arrived, I was thrilled with what I saw. It looks much bigger in person and it has 3 very roomy compartments. 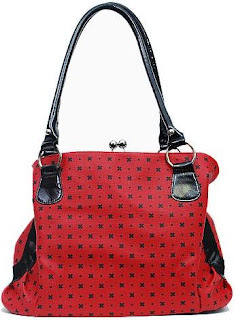 It also has very durable and soft faux leather handles. I love this, because a lot of handbags have rigid straps and after long, they dig into your arm and shoulder. The straps are also not too short or long. Just perfect for throwing over your shoulder and carrying, without a fuss. Those of you that have bigger arms, you will love this. Over all, this bag is so cute and i'm really impressed with the quality. It is well worth the $34.95 retail value. and seems like it will last a long while. Felix the cat metal badge. "Felix the cat" sewn into the front in black. 3 compartments, 1 large change purse kiss-lock style in the middle, that spans the entire width and length of the purse. Including puckered areas. 2 medium pockets on each side, that snap close. Heavy duty, long straps in faux leather. Heavy duty canvas & faux leather throughout. Bottom base to keep it's shape. Cinched in at the sides. You can check Bagblaze out on Facebook and keep up with the latest selections offered. Also, for every bag you buy at full price, you get $5 toward a new purchase. If you buy enough bags, you get one free! Today, I'm excited to be able to offer my readers a chance at getting the EXACT same bag. Good Luck! 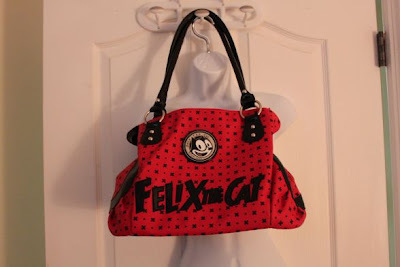 Can't wait until this giveaway starts -love the purse Felix the cat even more! My favorite colors are black and red! AND I watch Felix the Cat in a weekly basis with the kids! Would LOVE this bag. Thank you! I love felix the cat! I have a tattoo of him on my back.... the one part I've always not been 100% on is where to put his bag.... now if I win this I can put it on my arm!!!!! THAT would be freaking awesome! That bag is one of the cutest bags I have seen. Love it! I love the size and how unique it is! Adorable! I love the Felix bag!! I want it! Adorable!! I would so use that! Looks super cute and nice quality! I love Felix the cat! The bag is a lot nicer up close than I thought it would be. It looks pretty, yet sturdy. Great write up - Loved the video link too! WOW! I just told my husband today that I wouldn't buy a purse online because pictures just don't give enough detail. This is really an impressive review. I already created an account! My daughter would love this! She's been saving money doing odd jobs trying to get one of these.... she's only 12. We love everything about the bag.. The color for sure! I love Felix the Cat!! that purse is THE cutest! It is the cutest purse I've seen.. I love felix the cat and red and black are my fav colors awesome giveaway thanks! This is awesome. I like the nice geometric design throughout. I love all the compartments! I love the color and style. Very nice. I like all the compartments it has. I love the purse clasp in the middle of the bag. The clasp and the red color totally make this purse. Lovely. The Felix badge totally sets off the red and black. Makes the whole thing pop! I've always been a fan of Felix the cat! I love the size and the color of the bag so fun! I like the clasp, and the short handles, and the polka dots! I love all of the storage parts!